Cloud Computing | Reveille Systems, Inc.
Reveille Systems, Inc. has partnered with industry-leader, Cbeyond to offer Cloud Computing Services that make enterprise-class solutions available, AND affordable, to customers of any size. Does your business need the reliability and availability of applications from any location at any time? 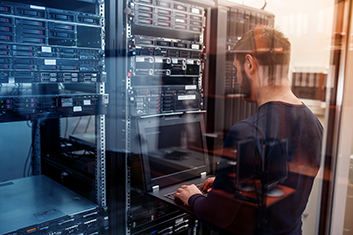 Let our engineers design a solution that moves your business critical applications and systems to a datacenter environment resulting in increased availability and uptime, while reducing future infrastructure investments, licensing costs, and training expenses for new employees. Your business-critical applications and systems are supported by our team of experts, further ensuring the breadth and depth of expertise is always available. Reveille Systems enables your business to leverage the speed and power of the Internet to increase office efficiency, enhance communications, inspire collaboration and simplify your network. WEB HOSTING – don’t let your business website be unavailable due to a server crash, power outage, or unreliable Internet connection in your office; our web developers and engineers can design and optimize a web hosting solution to ensure your web presence is always available and online. MICROSOFT DYNAMICS CRM – take advantage of enhanced collaboration features in Microsoft Outlook and other applications to organize and automate business processes focused on customer relationship management. MICROSOFT EXCHANGE – deliver the ultimate collaboration solution for business-class e-mail that includes a robust suite of features including email, contacts, tasks, calendars, shared calendars, and public folders. Microsoft Exchange 2007 and newer versions also support mobile users with Android, iPhone, BlackBerry, or Windows Mobile devices – extending your office to you, while you’re on the go! If you could benefit from increased market share, greater efficiency or a better bottom line, Cloud Computing Services from Reveille Systems may be the answer. If you want to know more about Reveille Systems’ Cloud Computer offerings or what we can do for your business, give us a call at (540) 373-9595 or complete the contact form on this page.